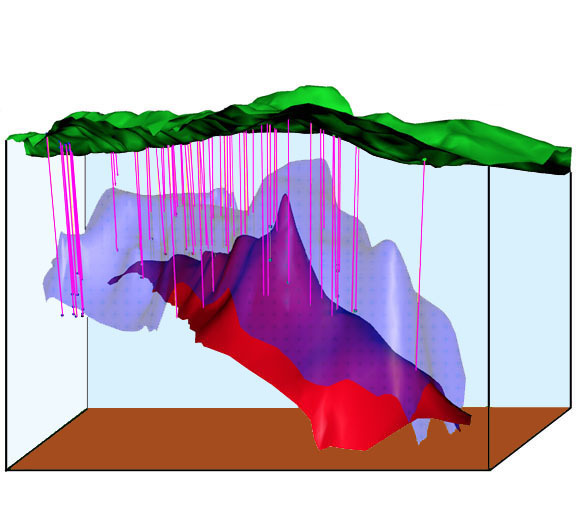 Schematic diagram of the "felsite" intrusion (red), top of the overlying geothermal reservoir (purple), and surface topography (green) at The Geysers steam field; the view is looking towards the south-southeast from 700 m beneath the ground surface. Vertical exaggeration equals 2X. The red surface of the intrusion/pluton is closest to the surface toward the center of the diagram at the south-central Geysers. Magenta lines represent the approximate location and depths of wells. In reality, most wells are deviated from vertical and are thus not accurately depicted by the vertical lines on the figure. The fluid reservoir itself is everywhere located above the felsite and mimics its general shape. This 29-page report contains gas and isotope analyses of fluids discharged from steam wells in The Geysers geothermal field, Sonoma, Lake, and Mendocino Counties, California. These samples were collected and analyzed by a variety of USGS scientists over a period of 20 years. Though sampling and analytical methodologies were not always identical, we have made every effort to ensure that the data are consistent and comparable, and we believe the data published herein are accurate within the precisions reported. In addition to analytical data and locations, we have provided additional information on the wells, such as their total depth, depth of casing, temperature, and pressure, to aid workers in their use of the data. View the text for the report as a PDF file (of99-304.pdf; 2.9 MB). Download the data tables as an Excel file (of99-304_tables.xls; 108 kb). View the suggested citation and version history. For questions about the scientific content of this report, contact Jacob B. Lowenstern. Download a free copy of the latest verion of Adobe Reader.